Fuji Electric India was established as a sales & marketing subsidiary, in 2009 at Mumbai. Today, FEI with its presence in 10 sales offices & 8 home offices serve the industrial & solution needs of their industrial customers.These offices are duly backed by Sales, Service & Application Engineers serving the users with wide array of products & solution from the family of Drives, Motion Controllers, PLCs, Servos, HMI’s, Process Controllers, Semiconductors, Field Instruments, Analytical Instruments & Condition Monitoring products / solution.FE is heightening the manufacturing capabilities by stepping up efforts for on-site capabilities, manufacturing technologies and human resource development. Three Pillars of Enhancing the Manufacturing Prowess are on site Capabilities, Manufacturing Technology, Human Resource. At Fuji electric, their philosophy is to satisfy customers to the best of their ability by providing them with creative and competitive solutions and services that live up to and even exceed their expectations. They emphasize on research and development to accelerate the development of new processes and products, and are committed to manage this development in a transparent way. They strive to reduce the environmental impact of their products during their manufacture, installation and operation by producing high quality products while keeping the environmental footprint of these products as negligible as possible. We strongly believe that change and progress that ignores the welfare of the human race is meaningless. Through their pursuit of innovation in Electric and Thermal Energy Technology, they develop products that maximize energy efficiency and lead to a responsible and sustainable society. With Electric and Thermal Energy Technology as Core Technologies, Fuji Electric contributes to the creation of responsible and sustainable societies through its business portfolios : Power and Social Infrastructure, Industrial Infrastructure, Power Electronics, Electronic Devices. AC Drive & Motion, Instrumentation & Automation, Semiconductor, Condition Monitoring System, Electrical Distribution & Industrial Control. 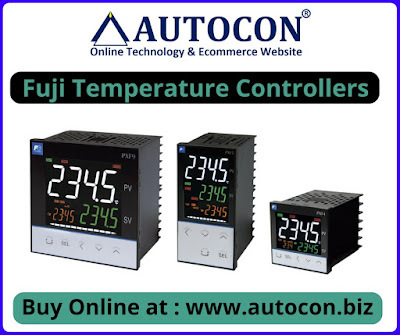 The digital temperature controller that incorporates a wealth of control functions plays a significant role in several fields. This controller features fuzzy control that can withstand the adverse effects of overshoot and external disturbances. This makes it the controller best suited to severe temperature control conditions. In addition to providing a waterproof structure, this controller offers a broad selection of sizes, thereby allowing to select the size best suited to area of application.